The Shinava Ridge neighborhood within Entrada at Snow Canyon in St. George, Utah is situated directly across from the Entrada Country Club. Homes in this exclusive community showcase stunning views towards Snow Canyon, Red Mountain, and Tuacahn. Depending on your home’s location, you may also have views of Kachina Cliffs panning around to the Arizona Strip and Western Plateau. 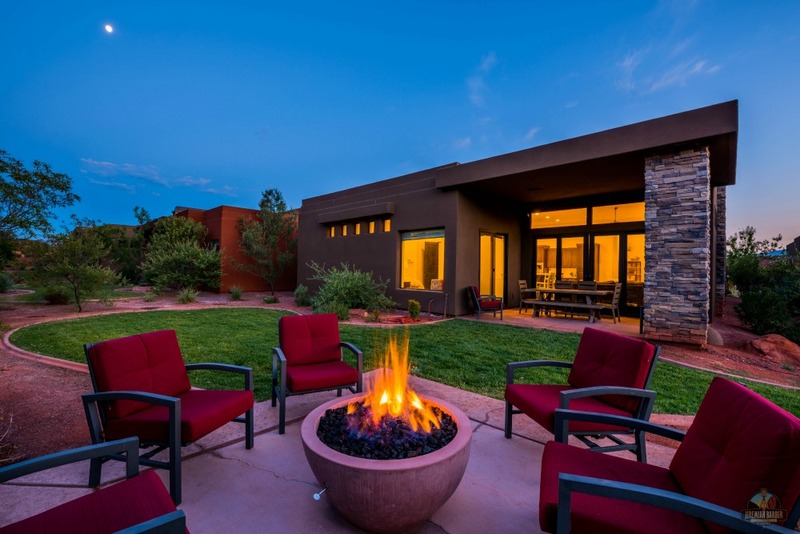 Living within the Shinava Ridge neighborhood is great for residents who are in proximity to events, dining, exercising, golf, pickleball, enjoying the pools — jaw-dropping views and great location to enjoy the amenities that Entrada offers. The Entrada at Snow Canyon community is one of the most prestigious golf course and country clubs in the United States. Set aside the human-made creature comforts and luxurious details for a moment and focus on the community’s location within St. George, Utah. No matter where you stand in Entrada at Snow Canyon, you’re amidst awe-inspiring scenery and tranquil panoramic views of ancient sandstone, black lava beds, red rock walls, and some of the most stunning burnt russet desert landscaping in the country. Entrada at Snow Canyon is a master-planned residential community whose heartbeat is the Entrada County Club and its accompanying Johnny Miller Signature Design 18-hole golf course. The country club at Entrada has won awards and is recognized for comfort, quality, attention to detail, and stellar customer service. The facility includes a swimming pool, tennis, locker rooms, dining facilities of both casual and fine varieties, a fully stocked bar, poolside service, a ballroom, boardrooms, and a state-of-the-art fitness facility. Also on the Entrada at Snow Canyon Property is The Inn at Entrada, a small resort hotel featuring suites up to four bedrooms in size. Without ever leaving the comforts of your home community, you could put together a golf and spa resort package that’s not a vacation, but a part of your lifestyle! Socialization is also part of the lifestyle at Entrada at Snow Canyon, and when you live at Shinava Ridge of Entrada, you’re right next to where all the action happens. Professional staff coordinators create a community calendar chock full of opportunities to gather, network, and socialize with your neighbors and friends. Not only are there special clubhouse events designed to entertain the entire community, but there are also smaller club-like outings for community members with similar interests. For example, residents with interest in photography may enjoy an outing together to take landscape photographs of some of St. George’s unique natural scenery. Homes within Shinava Ridge of Entrada are crafted with the finest material, high-end finishes, and all the creature comforts you could imagine. Rightfully so, the homes include floor to ceiling windows to allow in as much natural beauty from the surroundings as possible. Shinava Ridge of Entrada, tucked within Entrada at Snow Canyon, is in proximity to National Parks including Zion and Bryce Canyon among others. The location lends itself to active lifestyles that include hiking, biking, four-wheeling, and exploring St. George and surrounding areas.